What comes to mind when you think of Church? For some of us, it is basically going to Church for Sunday services. Be on time. Be on our best attire. Be present with others in worship. For many, it is also a time of spiritual nourishment, through the sermons and the overall worship experience. In any church, there are ordinary church-goers, sprinkled with a small group of gutsy church-servers. Based on the ‘pareto principle,’ a large group is served by a small group. A typical 'pareto principle' for Church is 80-20. It basically means 80% of the work is done by 20% of the people at any one time. In some cases, I hear that it can be lower than the 95-5 percentile. Efforts to address the lack of servers in Church are met with standard replies like "I'm busy," or "I don't have the time," or "I am not gifted," or "Thanks, but no thanks!" Having served in various leadership positions in churches, I am used to people replying in the negative when it comes to serving in church. It can be discouraging. What makes it even more disconcerting is that many churches seem to be fighting a losing battle as far as the 'pareto principle' is concerned. You can say that the Church is God's House, but chances are people are more likely to tend to their own houses first. They quote 1 Tim 3:5 about the need to manage their own households first, as a convenient escape clause from Christian service. In some cases, some church-goers even think that all the work should be done by all the paid staff in church! Why are there so few volunteers in church ministries? In this article, I shall try to list three common reasons, followed by a proposed paradigm shift for all members. Doing Church is certainly one of the most challenging tasks in our modern world. Christians serving in Churches are known to be among the most stressed-up people in our society. Think of a working professional holding down a pressurizing full-time job. Couple this with the need to spend time daily with his or her spouse. With both persons working full-time, this pressure gets multiplied by two. Throw in 2 growing kids (or more) and the stress rises a few notches. Toss in the educational challenges, stir in them after school activities, plus the daily stresses of modern living, and we get a melting pot of stress galore. 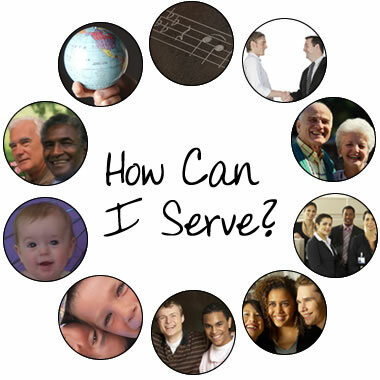 If the pot is already filled to the brim, how can anyone even think about serving in Church? Key Challenge: With such high stress in society, why should I do Church and make things even more stressful for myself? The second reason why people are reluctant to serve or volunteer their services is the fear of being trapped in endless service year after year. Over the years, I see faithful people serving in their respective ministries without complaining. They bring forth their best ideas. They give of their time and resources. They volunteer to pay for materials out of their own pockets. Without support and encouragement, when fatigue steps in, motivation steps out. When outsiders see how existing ministry leaders and servants are struggling, it is not surprising that they want to avoid getting involved in the first place. Worse, over a period of time, some elders or long-term pillars of the church who have been doing church may themselves succumb to the temptation: "If you cannot beat them; Join them!" Key Challenge: Why should I get involved in a ministry that nobody seems to want to do? Why should I bother, if others are uninterested? This third reason is perhaps the most important reason of all. Churches have become too fixated on their own problems. As a result, they have unwittingly dug their own rabbit's hole of non-stop business of maintenance. This is probably one of the biggest reasons why Church missions have become stagnated. Instead of a Church of disciples embarking on a mission to the world, we have a church content with its merry-go-round of maintenance of current church structures. I like to suggest that in order to clarify the church’s purpose, we need to ask 2 questions. This brings me to my main point: Church ministry is not about 'doing' church work. It is about 'being' church. We begin by learning to ask the second question. The second looks beyond the ‘doing’ toward the ‘being.’ The proverb of iron sharpening iron helps us to appreciate community building. It is about one metal helping the other metal to become a better metal. It is about enabling one to enable another to become a better person. In other words, we the church are responsible to help one another become a better church. The church is not about doing activities. It is about being the church that serves the community both inside and outside the walls of the church building. We do so through thoughtful engagement. We sharpen one another through constructive criticism, and positive affirmation. We speak the truth in love. We push each other to be better disciples of Christ. In Stephen Macchia’s book, “Becoming a Healthy Disciple ,” he proposes 10 traits of how a healthy disciple looks like. One of these traits is #4 where a healthy disciple is one who “learns and grows in community.” I like this particular trait. It has 2 aspects, and both funnel into a paradigm of community rather than self. When we learn, do we learn for the sake of self-consumption, or community-edification? When we grow, do we grow for the sake of puffing self up or to build others up? Let me ask the ordinary church member? 1. What is the purpose of growing, with regards to community building? 2. What is the point of learning, with respect to community? 1. What is the meaning of Church? 2. What is your Church for? • Do not ask: What position are you in the Church? o Ask the second: "Where is the position of Christ in the Church?" If asking the first question is ‘doing church,’ asking the second question is ‘being’ church. Let me close with an example. A pastor I know personally finds it challenging to get people to be involved in a certain ministry initiative. He raises the first question: "What do you think about the Church doing this community project this year?" "That's a great idea. I'll support it if I can." In other words, the parishioner is saying: "Good for you, but count me out." A better response would have been: "That's great. How can I be of help?" How can I help to grow strong healthy churches? What can I do to be a church to the community? Where can I be of help to build the church? These are second questions that exemplify 'being church.' May I challenge you to ask the second question of yourselves. How willing are you to let God use you to build up the Church? As long as we are caught up in a 'doing church' paradigm, we will see church as an additional stress point. We will fear getting stuck forever in any one ministry. We will lose our sense of purpose as Church. If there are three words that best exemplify being Church, it comes across as Christ speaking to us: "Be My Witnesses." Everything else flows from this, including our second questions.